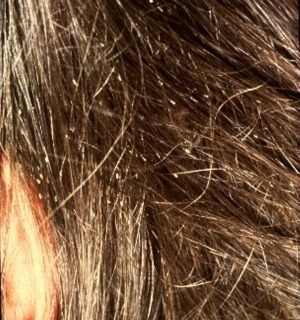 Head lice nits can be hard to see and also to distinguish from dandruff. See pictures here and learn how to get rid of head louse nits. The term "nits" is a rather loosely defined. It can mean lice eggs, but also can mean an empty egg case that is still clinging to the hair after the head louse has hatched. The picture to the right shows a louse nympth about ready to hatch from its egg, so the egg cap has dissolved. Once the louse leaves the empty egg case will remain on the hair shaft. 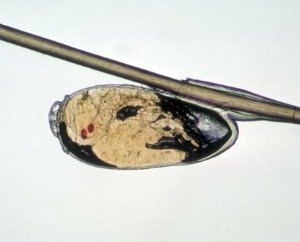 In a previous part of this series, when learning about head lice information, we learned that lice lay eggs on the hair shaft. These eggs have a hard coating around them which acts like glue to keep them attached to the shaft of the hair. Head lice will lay these eggs generally close to the top of the hair shaft, but the exact location varies depending on temperature. They choose the area of the hair where it is the best temperature for the eggs to develop properly and hatch. That is why I can't give you any hard and fast rules about what area of the hair you should look at for head lice nits. It just depends. In this photo the louse is not as close to hatching, and is still in the egg phase of its life cycle. What Do Head Lice Nits Look Like In Human Hair? The pictures I showed you above of head louse nits were on the microscopic level, but that is obviously not how you will see them when looking through your own child's hair. Therefore, I believe this picture to the right is also quite helpful to let you see what the head lice nits look like to the human eye, while they are in human hair. As you can see, you can barely see them, unless you look carefully. They can easily be mistaken for dandruff because while on the hair shaft they look kind of white, but do not fall out of the hair like dandruff does. Using either a lice comb, or your finger, you can run down the shaft of hair and remove the nit. When you examine it though it will not look white then, but will be brown in color, not white like dandruff. 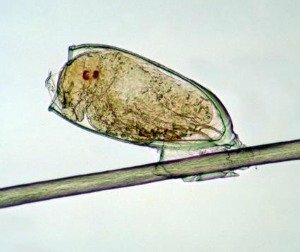 Do you recall what I said above about lice choosing a certain position on the hair shaft to lay their eggs depending on what temperature works best for development and hatching? 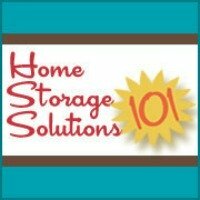 This is important information, because one of the ways to kill head lice nits that are still viable is through heat. Now, you can't just start blasting your child's scalp with heat, because it can hurt them. However, I have heard several suggestions (including from our school's nurse) to use a hair dryer on your child's hair on the hottest setting they can stand without burning them, and blow dry the hair, especially where you see any nits. This will help dry out the eggs and keep them from hatching. Nitpicking - If Your Child Has Head Lice You Will Understand The True Meaning Of This Phrase Much More Clearly! Although I suggest using a hair dryer on your child's hair to help dry out and kill viable head lice nits (see above) I defintely wouldn't just count on that treatment alone being 100% effective, so I wouldn't feel comfortable leaving any nits in my child's hair. After all, if just one or two eggs survive and hatch, you could have the beginnings of another head lice infestation on your hands, and then you have to start all your head lice treatment activities over again. All the stuff you need to do is exhausting to get rid of head lice, so you need to become an expert nitpicker and get all those head lice nits out of your child's hair. The definition of the verb "nitpick" is "to be excessively concerned with or critical of inconsequential details." Well, the origin of the term comes from, you guessed it, head lice. 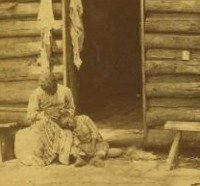 Head lice nits are nothing new to human society, and for as long as human history can recall, and probably longer, women have been looking through their children's hair to remove nits, like the picture on the left. Now the term is used to talk about things that are inconsequential, but when looking for head lice nits you have to be meticulous, and to really rid yourself of head lice each nit found and removed is quite consequential, and its own little victory. I find it hard to visually see the difference between an empty egg case and one that is viable and just hasn't hatched, at least with the naked eye, even after removing it from the hair shaft. Therefore, I suggest assuming that all head lice nits you see in your child's hair can still grow up to be little lice, and making sure you remove them all. This is easier said than done, however. I know, I've been there, and been overwhelmed by the amount of hair to go through little section by little section. The introduction portions of this series about how to treat head lice is about over, and now the the upcoming parts of the series will discuss in more detail exactly how to remove head lice nits from hair, and also get down to the nitty gritty of ridding your hair and home of these bugs.